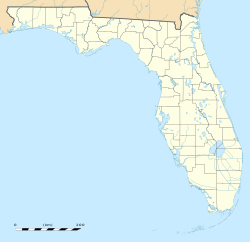 Fort Lauderdale – Hollywood International Airport (IATA: FLL, ICAO: KFLL, FAA LID: FLL) is an international commercial airport in unincorporated Broward County, Florida, It is southwest of Fort Lauderdale. It is also located near the city of Hollywood. The airport is 21 miles (34 km) north of Miami. In 2010, the airport had 22,412,627 passengers This included 3,447,393 international passengers. From June 2010 through May 2011, the top five users off the airport were Southwest Airlines, Spirit Airlines, JetBlue Airways, Delta Air Lines and US Airways. At that time, FLL was the 22nd busiest airport in the United States. It was the nation's 15th busiest international airport. It was one of the 50 busiest airports in the world. ↑ "Fort Lauderdale, FL: Fort Lauderdale-Hollywood International (FLL)". Bureau of Transportation Statistics. May 2011. This page was last changed on 12 March 2013, at 01:18.